GENERAL: John Lennon Signed Limited Edition I Do Lithograph (2/300) from the Bag One Suite (1970). 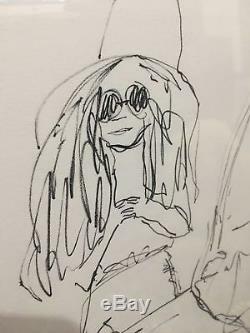 Lennon created a series of drawings depicting scenes from his and Yoko Ono's wedding and honeymoon and gave them to her as a wedding present in 1969. The next year, a series of lithographs were created based on the original drawings and exhibited in New York and London. There were 300 numbered sets of the prints created by hand-pulled lithography on BFK Rives paper, each 30" x 23" in size, and signed in graphite by Lennon. 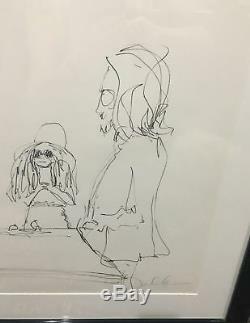 This one, titled "I Do" depicts John and Yoko in front of the Registrar in Gibraltar as they were united in matrimony. Numbered at lower left and signed "John Lennon" at lower right. 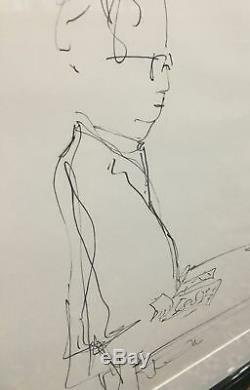 SPECIFIC: This is an UNFRAMED Lithograph of the John Lennon art piece titled "I Do". 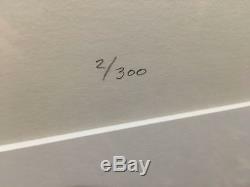 This very rare hand numbered and signed original lithograph is #2/300. It is in EXCELLENT+ condition with no major flaws or problems. Would be an outstanding piece to have professionally framed. This was part of the ORIGINAL edition of 300, that John Lennon personally signed himself. It measures approximately 30" by 23". 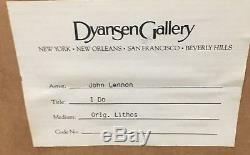 LOW Numbered pieces were usually reserved for those in the "Elite" family or friends of John and Yoko. Not sure who owned this originally but, is up for sale currently. 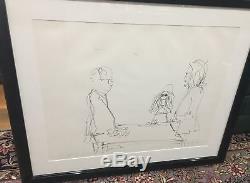 I have never seen a lower number of these highly sought after lithographs done by John Lennon which makes it even more of a desirable piece of artwork. This is the REAL DEAL. Don't miss out on this extremely rare and desirable piece of artwork signed and numbered by John Lennon himself. 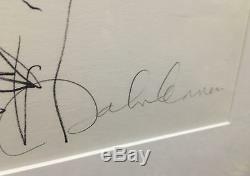 The item "John Lennon Beatles Signed I Do Bag One Lithograph EXTREME LOW # 2 / 300 RARE" is in sale since Saturday, February 9, 2019. This item is in the category "Entertainment Memorabilia\Music Memorabilia\Rock & Pop\Artists B\Beatles\Other Beatles Memorabilia". The seller is "applebeatle" and is located in Vincennes, Indiana. This item can be shipped to United States.